Are you entrepreneur who wants their website launched fast and on a budget? Or maybe you design websites for customers, but not really “techy” kind of person and need help setting up WordPress and customizing the theme? In other words, if you need to launch a WordPress theme based website fast and need a hand with technical side of things, there is help! We will setup WordPress, customize theme with your branding, format all content, install plugins you need and do everything else to launch your WordPress website in just one day. Yes, just imagine: one day, one fixed price. Now you can be 100% sure about the timeline and cost – start planning your next website project! 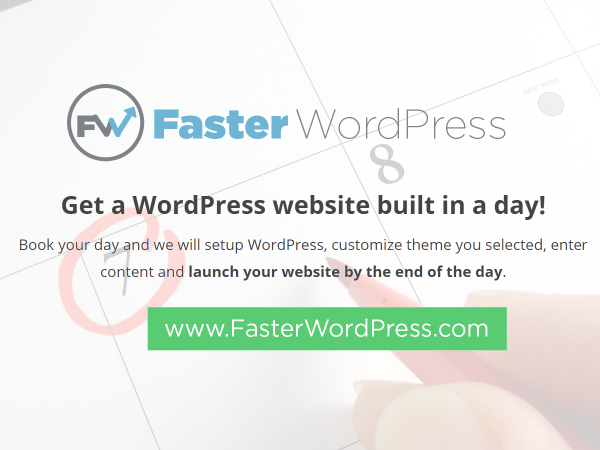 For the details of the WordPress in a day service and to book your day check www.fasterwordpress.com.